"Cloud Computing Architecture with Open Nebula – HPC Cloud Use Cases" is the title of the invited talk that I gave yesterday at the NASA Advanced Supercomputing Division – NASA Ames. I provided an overview of cloud computing architecture with OpenNebula, with special focus on cloud deployments for High Performance Computing environments. You can find bellow the slides and the abstract of the presentation. It was a great opportunity to interact with Piyush Mehrotra's group in the Computational Technologies Branch to discuss how OpenNebula can address their needs, and to talk with some of the people involved in the Nebula Project. Thanks for the invitation!. OpenNebula is a fully open-source cloud management platform, with excellent performance and scalability to manage tens of thousands of virtual machines, and with the most advanced functionality for building virtualized enterprise data centers and private cloud infrastructures. OpenNebula is the result of many years of research and development in efficient and scalable management of virtual machines on large-scale distributed infrastructures. Its innovative features have been developed to address the requirements of business use cases from leading companies in the context of flagship international projects in cloud computing. OpenNebula is being used by many supercomputing and leading research centers to build HPC and science clouds for hosting virtualized computational environments, such as batch farms and computing clusters, or for providing users with new “HPC as a service” resource provisioning models. The talk describes how to design a cloud architecture with OpenNebula and its innovative features to enable the execution of flexible and elastic cluster and high performance computing services on demand while reducing the associated cost of building the datacenter infrastructure. It has been more than two years since the European Commission published in January 2010 its pioneering report about the Future of Cloud Computing. A group of experts was established with the aim to evaluate the state-of-the-art and develop future research directions in cloud computing. Since then, there has been considerable advances in the field, developments have closed some gaps that were identified in this report, but more challenges have emerged. We were re-convened by the European Commission in 2011 in order to capture these changes and maintain a state-of-the-art view on cloud computing technologies, its position in and its relevance for Europe. 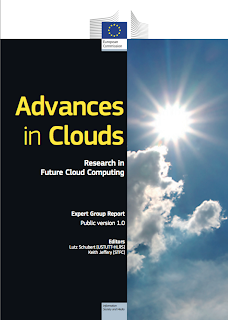 The experts, led by Keith Jeffery, Lutz Schubert and Maria Tsakali, have produced a final version of this report entitled Advances in Clouds - Research in Future Cloud Computing. The report brings valuable information for people defining Cloud Computing strategies, developing innovative research lines, or exploring emerging market opportunities beyond today’s Clouds. It is a must-read.